comment This exclusive ticket is not available in resort and can only be pre-purchased before you depart. 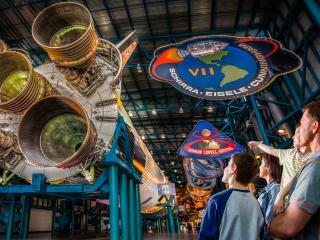 Now includes 2nd day FREE admission to Kennedy Space Center Visitor Complex. Once-in-a-lifetime chance to have lunch with a real life astronaut. 2-hour KSC Explore tour offering access to areas normally closed to the public. Plus you can enjoy lunch with a real life astronaut and join in exclusive tour to the more restricted areas of the Kennedy Space Center! Lunch with an Astronaut program - once-in-a-lifetime chance to have lunch with a real life astronaut. Hear about space adventures first-hand from someone Who has experienced a launch and the wild ride into orbit. See photos and videos from the astronaut’s missions, ask questions and snap a photo with your new astronaut friend. KSC Explore Tour - A two hour tour offering access to areas normally only open only to NASA personnel and the chance to capture once-in-a-liftetime photos of the giant structures that make up the World's Largest launch facility. See many of Kennedy Space Center's most historically significant buildings including the KSC Headquarters, the newly renamed Neil Armstrong Operations & Checkout Building where astronaut crews spent the final days before their flights and the International Space Station Processing Facility, where components of the ISS were built before being ferried into space. Get an up-close look at the coastal launch pads that unleashed the power to put people on the moon and send space shuttles to the International Space Station and stop for photos outside the 525-foot-tall Vehicle Assembly Building (VAB). Inside these high-bay doors, the Saturn V moon rockets and space shuttles were stacked and prepared for launch. gram, the Orion capsule aboard the Space Launch System (SLS). Along the way, your tour guide will share historical facts about the sights you’re seeing – vehicles, buildings and structures crucial to current and past operations. The tour culminates at the Apollo / Saturn V Center, home of the Largest rocket ever built - a 363-foot long moon rocket. NASA reserves the right to cancel or alter locations and/or security requirements for the Kennedy Space Center Explore Tourwithout notice. For operational reasons you will be sent a voucher Space Pass which is easily exchanged at the voucher redemption window at Kennedy Space Center Visitors Complex. Car parking is not included in the ticket price. Appoximate cost is $10 per car, payable locally. 2nd Day Free must be taken within 7 days of your first visit. Kennedy Space Center an easy 45-60 minute drive east of Orlando. Do I have to name a date I wish to visit Kennedy Space Center? Yes. Both the Dine with an Astronaut program and the Kennedy Space Center Explore Tour sell out at busy times of the year and these elements cannot be guaranteed without a prior reservation.